Many plants and crops depend on bees for pollination, e.g. apples, carrots and rapeseed. 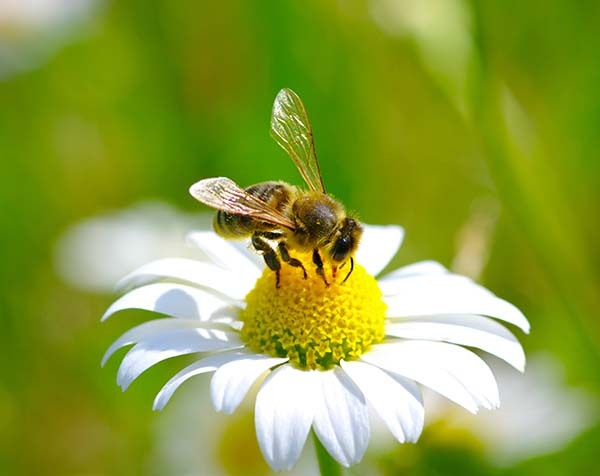 Bees are rapidly declining and there is an urgent need for us all to help them survive. Here is how and why you should attract bees to your garden. Why Attract Bees to Your Garden? The alarming and unprecedented bee crisis is due to a number of environmental factors, including climate change, agricultural practices, habitat dilapidation, disease and parasites. By having a garden you are in a position to help by creating a welcoming habitat for bees, and you will benefit too. There are a few easy steps you can take to help create a bee-friendly garden that will turn your garden into a sanctuary for these helpful pollinators. Flowers are a great way to attract bees to your garden. Flowers with a single row of petals, such as bluebells and poppies, are more attractive to bees. These single-petal flowers have more pollen than other flowers, so they provide more food for bees. Flowers clustered into bunches of one species will attract more bees than individual plants scattered throughout the garden, so make note of this when you are planting your bee-friendly plants. If you grow your own fruit and vegetables at home, bees will also benefit. A lot of vegetables, fruits and berries, especially cherries, yield fragrant flowers that are attractive to bees. These colours attract bees more than pinks, oranges and reds. You don’t have to exclusively plant your garden with these colours, but having a good amount of them will help. Wormwood is reputed to repel bees but there is no scientific evidence to support this, and bear in mind it is poisonous. Avoid carnivorous plants such as the pitcher plant and venus fly traps. Plants such as pansies and double begonias offer little benefit to bees due to their shape and little-to-no production of pollen or nectar, but they won’t repel them so they are safe to include. Bees like all other wildlife need to drink, so include a suitable water feature in your garden if you can. Bees aren't able to land in deep water; they need an island to land on so they can walk to the edge and take a drink without drowning. You can use a wide and shallow dish or tray and line the edges with flat rocks. Pour water in and place it near the flowers that attract bees. Bees are susceptible to pesticides and other chemicals used in gardens, so avoid them where possible if you wish to create a bee-friendly garden. Bee shelters can be bought from garden centres, but you can also make your own by simply drilling holes into the side of a log. These holes will provide small chambers for the bees to live in. Leave some ground uncultivated in a sunny spot to allow burrowing bees to seek their own shelter and nesting spots. There are over 70 species of burrowing bees in Ireland. If you liked this guide you may want to read our Year Round Bird Care guide, or why not head over to your local Topline store and browse through our garden department and see what you could pick up.